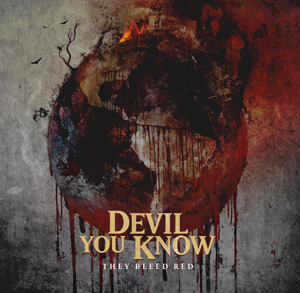 DEVIL YOU KNOW Cover SURVIVOR's "Eye Of The Tiger"
DEVIL YOU KNOW are currently streaming their cover version of the classic Rocky movie series anthem track, "Eye Of The Tiger". This is a rousing, hard rock rendition to the SURVIVOR hit song and is certainly a must listen. Check it out now below. The track is also now available as an additional, third instant track for all iTunes pre-orders. John Sankey (drums) states: "One day when we were in the studio working on our new album, They Bleed Red, (vocals) turned up in a shower robe and started shadow boxing in the vocal booth while doing his best Rocky Balboa impersonation. It was so impressive that we immediately knew we had to do a cover of the infamous Rocky soundtrack theme, "Eye Of The Tiger". We had already been discussing the possibility of recording a cover, but had no idea what song we would do. In that moment when Hojo literally transformed himself into the Italian Stallion right in front of our very eyes we knew it was the perfect choice! Our biggest challenge would be adapting the original song into our own style, so we decided each of us must take on the persona of a different cast member to best capture the performance necessary to do such an iconic song justice. Howard lived and breathed the role of Rocky for a full week, Francesco Artusato (guitars) became as a slightly shorter Ivan Drago, Ryan Wombacher (bass) was the perfect fit for a modern day Mickey and I of course was a 'way too Australian' not quite as ripped version of Apollo Creed. We entered the studio swinging wildly in all directions with our respective instruments and there was blood, sweat and many many tears, mainly of uncontrollable laughter. Hours later we emerged victorious and super slow motion high-fived each other in classic Rocky fashion as we listened back to the sweet metal sounds of a reformed SURVIVOR classic. We hope you all enjoy it as much as we do." They Bleed Red is available everywhere on November 6th (Nuclear Blast Records). Howard Jones (vocals), Francesco Artusato (guitars), John Sankey (drums) and Ryan Wombacher (bass/backing vocals) deliver a dense monstrosity of technical prowess and angst-ridden passion, according to a press release. A deep interpersonal understanding and an evolving camaraderie set the stage for the unique confidence behind They Bleed Red, the band’s ferocious follow-up which extinguishes any so-called “sophomore slump” without mercy. It’s the sound of primal bloodlust. Produced by Josh Wilbur, They Bleed Red is a breakneck paced trip through DEVIL YOU KNOW’s broken psyche, struggles with anxiety, and ultimate triumph against adversity, all laid upon a foundation of high-level artistic achievement and vitriolic full throttle heavy metal fury.